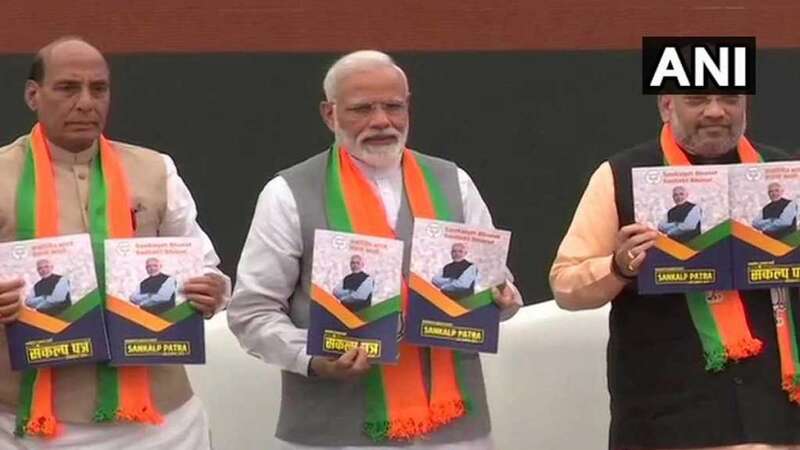 New Delhi : The Bharatiya Janata Party on Monday released poll manifesto - Sankalp Patra - for the upcoming Lok Sabha Election 2019. Prime Minister Narendra Modi, BJP chief Amit Shah and Union Home Minister Rajnath Singh were present at the event. # With this sankalp patra, BJP is taking a step towards building New India, said Rajnath Singh. # As India will complete 75 years of Independence, BJP will fulfil 75 promises mentioned in the poll manifesto. # We are committed to annulling Article 35A of the Constitution of India as the provision is discriminatory against non-permanent residents and women of Jammu and Kashmir. # Short-term agricultural loan will be provided to farmers upto Rs 1 lakh at a 0% interest rate for 1-5 years on the condition of prompt repayment of the principal amount. # Women's welfare and development will be accorded a high priority at all levels within the government, and the BJP is committed to 33% reservation in parliament and state assemblies through a constitutional amendment.